The 94-FMS-1-A Flexible Manufacturing Robot Integration Training adds to the 94-AMH-1-A Automated Material Handling Learning System to teach advanced programming application of robotic systems. Applications include linear motion, palletizing, barcode readers, digital gauging, CNC workcells, serial communications, multitasking and interrupts. These capabilities are commonly found in the current generation of industrial robots. 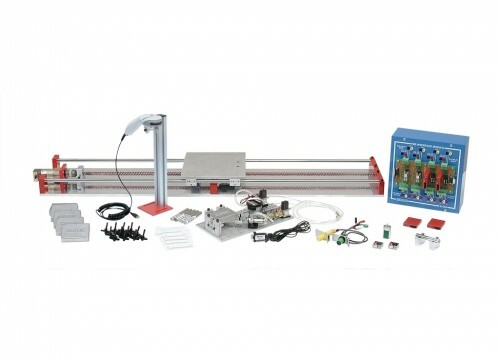 The model 94-FMS-1-A provides real world components students will use to create workcells that model industrial applications of advanced robotics. Students will develop flexible manufacturing robot programs, design and build interfaces, install automation components, and demonstrate the operation of live systems. Amatrol’s Flexible Manufacturing Learning System includes a digital gauging module, barcode reader module, serial communications module, servo traverse axis, FMS interface module, sensors, test components, student learning materials for theory and lab, and teacher’s assessment guide. The learning materials also support the use of an optional CNC machine module to demonstrate robot loading and unloading. Contact Amatrol for compatible CNC machine models. Barcode Communications- Students will learn how to program a robot to use RS-232 serial communications to receive and interpret data from barcode readers and other serial devices. The 94-FMS-1-A applies the extensive program command set of the Amatrol servo robots, which includes a number of serial communications commands. Digital Gauging- The digital gauging system includes modular fixtures and an electronic indicator that students will use in their FMS workcells to measure precision dimensions on cylindrical and rectangular parts. The indicator communicates its measurement data to the robot via serial communications. The fixture clamp and indicator are electro-pneumatically actuated by the robot to enable fully automated operation. FMS Applications- The 94-FMS-1-A provides a student-configurable flexible manufacturing system interface module to interface the robot to a variety of CNC machines and other intelligent controllers. Students will learn how to determine what type of interface is needed as well as how to build and test it. These interfaces can be tested as part of the workcell or actually interfaced to a real CNC machine with the addition of an optional Amatrol CNC interface package. Multitasking and Interrupt Capability- Students will learn to create flexible manufacturing programs with advanced programming features like the ability to run multiple programs simultaneously and program interrupts. These features are especially useful in FMS applications where there are multiple controllers that have the need to communicate with each other and to perform direct process operation.